As I'm sure a lot of you know, this month Misty is hosting her Austen in August event, which will last from the 18th to the 31st. I am a fan of pretty much all things Jane Austen, so I participate every year. This time around, we're going to read an Austen adaptation for our #WednesdayYA book. After last week's Twitter discussion, this is the book that ultimately won. We hope you'll read it with us! Claire Prescott is a sensible woman who believes in facts and figures, not fairy tales. But when she agrees to present a paper to a summer symposium at Oxford on her ailing sister's behalf, Claire finds herself thrown into an adventure with a gaggle of Jane Austen-loving women all on the lookout for their Mr. Darcy. Claire isn't looking for Mr. Anyone. She's been dating Neil -- a nice if a bit negligent -- sports fanatic. But when a tall, dark and dashing stranger crosses her path, will the staid Claire suddenly discover her inner romantic heroine? Her chance meeting with a mysterious woman who claims to have an early version of Austen's Pride and Prejudice -- in which Lizzie ends up with someone other than Fitzwilliam Darcy -- leads to an astounding discovery about the venerated author's own struggle to find the right hero for Lizzie Bennett. Neil's unexpected arrival in Oxford complicates Claire's journey to finding her own romantic lead. 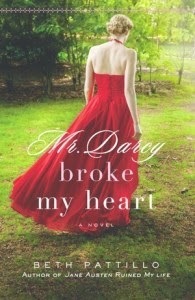 Mr. Darcy Broke My Heart is the story of a woman who finds that love isn't logical and that a true hero can appear in the most unexpected of places.